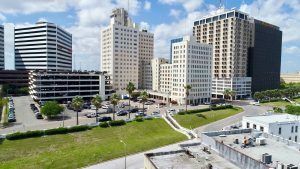 CORPUS CHRISTI, Texas – September 27, 2018 – Cravey Real Estate Services, Inc. has been awarded the exclusive leasing for Wilson Plaza located at 606 N. Carancahua St, Corpus Christi, TX 78401. The building is now under new ownership and offers new opportunities. Wilson Plaza offers a variety of options to suit your needs with space sizes ranging from 200 SF up to 10,000 SF. Wilson Plaza was built as 3 separate towers over a few decades. The east tower built in 1927 was the very first and is located on the bluff in Corpus Christi. Wilson Plaza is conveniently located in uptown Corpus Christi, near the Nueces County Courthouse, city hall, and business district. Wilson Plaza is the prime location to enjoy the panoramic views of the Corpus Christi bay. For more information about leasing space in Wilson Plaza, please visit www.wilsonplazacc.com. For historical information, visit www.wilsonplaza.com. This entry was posted on Wednesday, September 26th, 2018 at 9:22 pm	and is filed under Press Releases.